Also, in November and December I saw a few dance performances: ODC’s The Velveteen Rabbit, San Francisco Ballet’s Nutcracker, and Smuin Ballet’s The Christmas Ballet. All were very much fun and totally got me in the wintry holiday spirit. At the end of the year, my partner Thom and I were in Pasadena for a friend’s wedding. 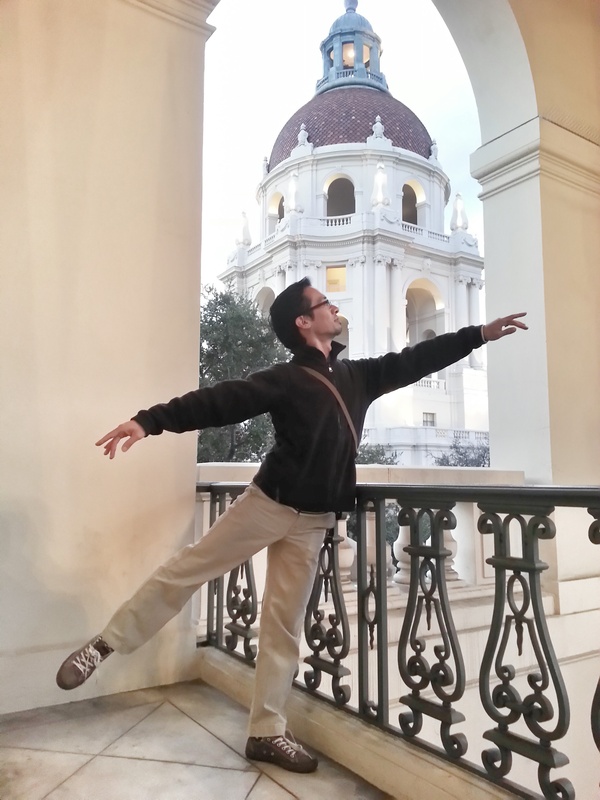 While in town we came across the City Hall, and I couldn’t resist taking a ballet photo with this gorgeous setting. I was already obsessed with posing with ballet posters… now add architectural wonders. Oh, just posing. Like ya do. I will definitely write more about the performing and performances in a forthcoming blog post. Until then enjoy this Yo-Yo Ma/Chris Botti version of “Auld Lang Syne” that one of my ballet teachers, Carla of Ballet to the People, used for révérence over the holidays. I bow in your direction, gentle reader. May your 2013 be full of lovely dance moments! P.S. If you missed the annual Vienna Philharmonic New Year’s concert on TV, you can check out the Staatsballett segments here and here. However, they don’t feel as exciting or interesting as last year’s, in my opinion. I adore your idea of posing in an architectural setting…I am going to try this on my next holiday 🙂 Happy 2013! Thanks for the comment. Yes, ballet everywhere! Happy new year!